If you know me very well, you would know that I am nothing less than a bona fide, dyed-in-the-wool musical theatre geek. And very proud of it. “There’s always a Broadway song for everything in life” is my unwritten motto, and singing musical theatre songs is a regular part of every day of my life. I was doomed at birth by having a musical theatre geek mother with an incredible super-high soprano voice and a passion for singing, who passed her ultra-musical-theatre-and-singing- obsessive genes onto me (unfortunately while I can *sing* soprano technically, I didn’t get quite the incredible voice of my mother. Sigh, you can’t have everything, can you?). So yeah, I’m doomed. And very happy as a prisoner to the glorious world where a person can randomly break into song and no one bats an eyelash. Wow, what I wouldn’t give to live in a world like that. Anyway. 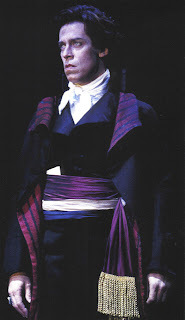 And anyone who knows me well knows that I am also nothing less than a bona-fide, dyed-in-the-wool Scarlet Pimpernel worshipper, one who puts the crazy Twilight fans to shame in the level of my adoration. 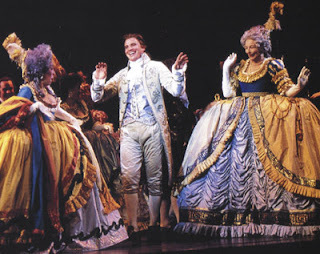 So naturally, soon after discovering The Scarlet Pimpernel, I learned that there was a little-known musical version of the story. When I first heard about it, I was rather skeptical, to be honest. While I normally staunchly believe that anything is improved with singing, I just wasn’t sure if it could do justice to the epicness of the story. And for some reason, the idea of Chauvelin singing was really odd. I have no clue why it struck me that way, but anyway. But finally I just thought, come on. Musical Theatre and The Scarlet Pimpernel…my two favorite things combined? What’s to lose? And now, a year-and-a-half after I first listened to the Cast Recording, I’m still not sure whether I love or hate this musical. It seems that classic literature is a great place to get musical material. From Dickens’ classic Oliver Twist becoming a hit musical in the sixties to Les Miserables sweeping the world twenty-five years ago and going strong today, people often turn to literature to reinvent on stage with huge results. What is not so commonly known is the scores of other classic literature that have been adapted to less-known and less popular musicals. Some of them, like Jane Eyre or A Tale of Two Cities, have all the ingredients for the sweeping epicness needed for a good musical. And some…just don’t quite have it. 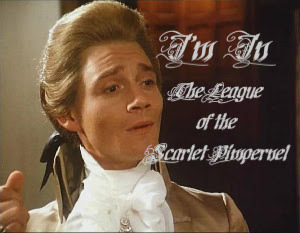 And in my opinion, The Scarlet Pimpernel falls in that category. There’s potential there, but it certainly doesn’t have the traditional unforgettableness of some of the earlier classics such as Fiddler on the Roof, West Side Story or My Fair Lady, and definitely isn’t on the epicness scale of some of the more recent blockbuster musicals such as Phantom of the Opera or Les Miserables, with their sweeping scores and unforgettable songs. Which is a pity. 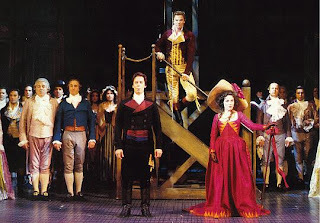 A story with the scope of The Scarlet Pimpernel deserves the “huge” treatment of these greats, with soaring numbers and flashy sets and lots of drama. Instead we get a few gems with a bunch of less-than-great songs, with an odd mixture of 18th century instruments and a score that sometimes absolutely screams the 90’s “poppish” computer generated sounding instrumentals that permeated the era. The one thing I can forgive is the fact that he wears those glorious boots. 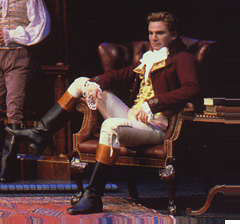 Have I ever mentioned that I adore the boots of the late 18th/early 19th century men’s fashions to *utter* distraction? 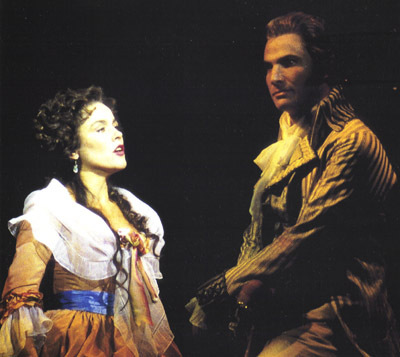 The Scarlet Pimpernel - the musical - was written by Frank Wildhorn and Nan Knighton and first premiered on Broadway in 1997. It went through dozens of revisions onstage with the script entirely rewritten, several songs cut, several added and several moved all over the place…in fact the cast recording little resembles the show if you were to see it today. Although it was considered a minor flop (or rather a ‘flash in the pan’) on stage, it enjoys a large cult following, and it seems that every high school and their brother have to stage a production (just take a look at the dozens of videos of those on YouTube). The duel. Not quite as epic as the 1982 film version’s. Just sayin’. 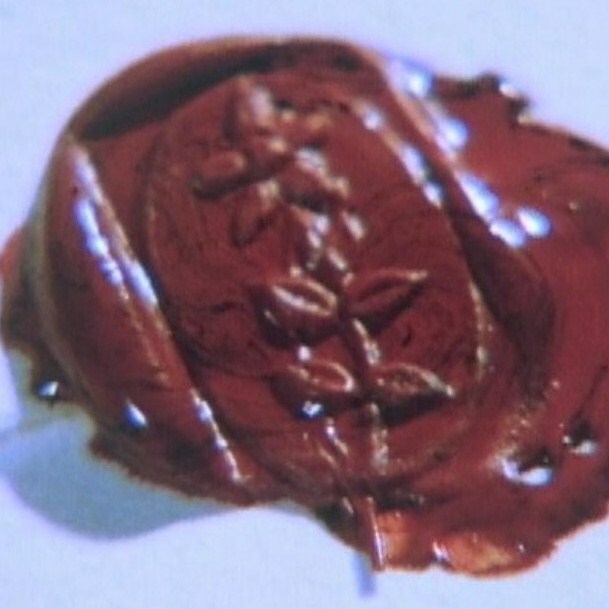 On the flip side, there are many similarities to the books and film’s plotlines…there’s the disguises, the ball, the former-love-interest between Marguerite and Chauvelin, the meeting between Marguerite and The Scarlet Pimpernel in the shadows, and even (*SPOILERS for those who haven’t seen the 1982 film*) their own spin on the film’s twist ending (a bit shakier in its execution…no pun intended…than the film’s, but still satisfactory – *End of Spoilers*). 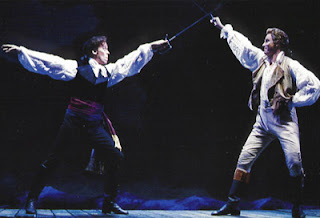 And the duel! Although Marguerite takes a stab at Chauvelin during the process. HORRORS. I mean, really, girl. Do you have to go stealing the spotlight like that? The duel is the ultimate ‘wow, what a heroic manly dude’ point, and really, we don’t want to see your girl power right now. We really don’t. So I was bugged there. And to make matters worse, Chauvelin actually beats Percy at the duel. Which ‘scuse me, peoples, would never happen. Ever. Ever. Ever. EVERRRRRR. So I was a bit miffed at that. Who thought up ‘the Bounders’ name? It’s the League, thank-you-very-much. Very impressive. Percy’s inane but yet witty banter is reduced to ridiculous bits and pieces about cravats and how his new satin coat “do shimmer so”. And they’re not even funny bits. Chauvelin is supremely rude…not that he isn’t in the stories, but there’s no biting remarks, no barbed insults, only extremely rude comments from a ‘they would never have said that in the 18th century’ point of view, with no consideration taken for things that would or would not be tolerated in society. Plus the very modern dialogue just does not give the feel of the story whatsoever. All that said, unless you were to see a production of the show, you wouldn’t hear about the script anyway. The point of the review is what you can get your hands on…the cast recording. 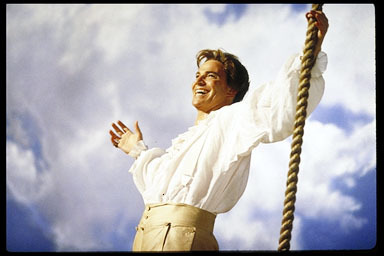 (giving off that Errol Flynn vibe. Douglas Sills plays Percy, and while he is most definitely not British, he does a fair job in the role. I have to give credit to the fact that he brings a lot of emotion through his voice, even if it’s just not quite what I’d imagine for Percy. 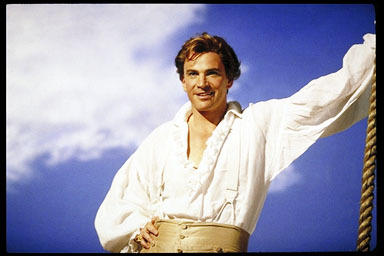 As the hero he manages it well…he kind of brings off an Errol Flynn sensibility that while not *my* picture of Percy :-), is still interesting. But as the fop…he just doesn’t get the fop right. And that’s what’s hard to put my finger on. 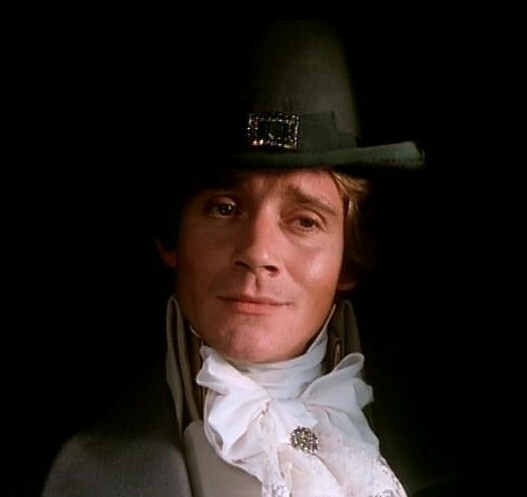 I’d describe him as too giggly, too silly, too effeminate…but then so was Anthony Andrews’ performance as the fop Percy in many ways. I just can’t quite place it…but it’s just not quite right. At least he has blond hair, ya know? Anyway. He does have a lot of charisma and energy in his performance, which is a big thing I like to see in actors, especially in theatre. I’ve seen bootlegs (recordings by individuals done at performances and usually posted on YouTube– there’s the definition for the non-musical-geeks among our group) and he does all right with what he has to work with, I guess. Christine Andreas played Marguerite. She has a very different, very rich-sounding voice. Linda Eder supplied the concept album (no longer available)’s voice of Marguerite, and you can see the similarities between Christine and Linda’s voices. She has a lot of vibrato in her voice…almost like a mezzo version of Sarah Brightman, except Christine’s doesn’t sound as forced. She plays Marguerite with a French accent…something that I can’t quite decide if I like or not. Ok, so Marguerite did have a French accent, not British like Jane Seymour (well, ok, a French-laced British accent was what she would have probably sounded like) but to the picky-details-me, if Marguerite, who is French, has an accent, then shouldn’t Chauvelin, who is French, have an accent, and then shouldn’t all the French peasants, who are French, have French accents, and then from there almost everyone in the musical would have French accents. Thoughts? She has a lot of emotion in her voice as well, and conveys that in her songs, particularly the beautiful “When I Look at You”, one of my favorite songs in the musical. More on that below. And she’s gorgeous, to boot (but a brunette…such is the fate of Marguerite :-)). So she did all right. 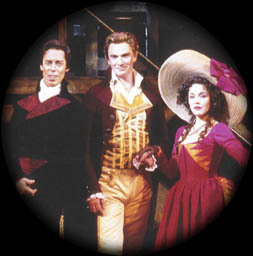 Chauvelin was played by Terrance Mann, known for originating other well-known Broadway characters such as Javert in Les Miserables and the Beast in Beauty and the Beast. His voice is well suited to the character…the former-romance angle of Marguerite and Chauvelin is really played up in this version, and he has that strength and rough passion in his voice that a rather villainous unrequited lover should have. 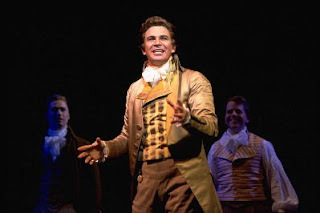 Unfortunately he doesn’t get a chance to really show his talent as well as he might, as he gets probably some of the weakest songs in the musical for his solo numbers. But he did a fine job and I’d probably place him at the top of the best-played characters in this show. “Madame Guillotine” is a spine-chilling number that is glorious from a “wow, what a great musical number” standpoint…a nice, gruesome, chilling song that captures the terror, the madness, and the brutality of the time. 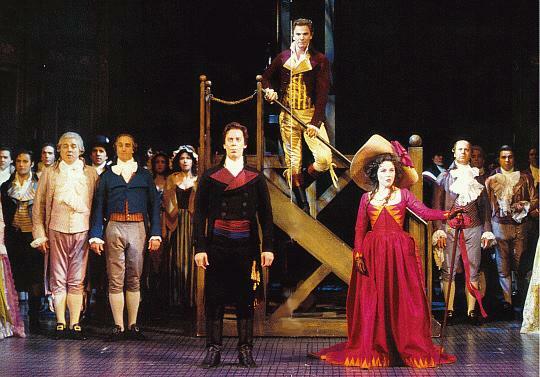 It is the second number in the show, showing the angry peasants as they’re herding the latest batch of victims to their “goddess of justice, with her glimmering, shimmering blade”. It’s a grisly song, but if you’re a musical fan, it has that ensemble-bloodcurdling-breath-catching quality about it similar to “At the End of the Day” from Les Miserables that reminds you exactly why you love musicals so much. Really sets the tone for exactly what the Scarlet Pimpernel is saving the doomed victims from. I give you the judgment of God! As she severs you, Madame Guillotine! You’ll be smitten with Madame Guillotine! God, when did man lose his reason? Save us my God, if you’re there! Like a fire in the air? “Into the Fire” has become one of my top favorite musical theatre songs period… the song when Percy is rallying the League together, it’s the perfect courageous hero’s song and is absolutely inspiring – especially to this courageous-hero-lovin’ gal. The more daring, risk-taking and visionary they are, the better. So this naturally captured my attention. He was only a boy, but he knew someone must take a stand. Rush in! We have to rally and win, boys! When the world is saying not to, by God! You know you’ve got to march on, boys! Never doubt that your courage will grow. And into the fire we go! “When I Look at You”, Marguerite’s melancholy solo performed early on in the first act, so perfectly expresses the hurt and frustration Marguerite feels at the sudden coldness and change in the man she loved. This was the first song from the musical I heard, and it remains one of my very favorites. I mean, how can you not love a song that so absolutely describes the turmoil that characterizes Marguerite before she discovers Percy’s identity? And now I don’t know who you are. Or could it be that I never really knew you from the start? Did I create a dream? Now remembering is all that I can do. “The Riddle” is the climatic number at the end of Act 1, and one of my favorites. 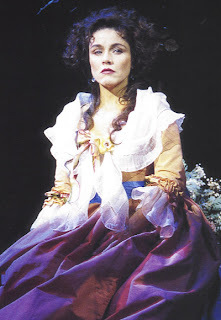 It talks of the struggle in Marguerite as she’s faced with the “either/or” of betraying the Scarlet Pimpernel or losing her brother, of Percy’s wanting to trust her but his fear of her betrayal, and Chauvelin tightening his noose over Marguerite. You turn, and someone betrays you. Should you trust me too? When we sell our souls away. The beautiful ballad “She Was There”, sung by Percy after his secret meeting with Marguerite when he realizes that she is innocent, is a lovely song. Listen to the Douglas Sills version, or look up the equally well-done version by Daniel Rodriguez (whose version of "Into the Fire" is my personal favorite, definitely over the Broadway cast album). We had so much to share. But her tenderness was everywhere. Just as if she’d always been right there. What a fool I must have been! When I’d never let her go? Douglas Sills singing "She Was There" in a bootleg from the show. Just have to say...the coat is horrendous. Percy would not be pleased. Of course, there are some equally lame songs to counter act the good ones… “The Creation of Man” has to be the most stupid song ever – Percy-the-fop and the gang explaining to the Prince of Wales about the importance of extravagant dress and being a dandy. Absolutely ridiculous. If I could cut any song from the musical it would be that one. “The Scarlet Pimpernel”, as the Blakeney’s servants all puzzle over who the mysterious fellow could be, is another equally stupid one. Percy’s famous poem has its own song, and while “They Seek Him Here” isn’t as horrid as some of the others, there’s nothing incredible about it. There’s a handful of other equally forgettable songs, plus a few that were later added and are not on the cast recording (“I’ll Forget You”, a song sung by Marguerite the night before she’s to be executed was later added but can be found on the “Encore” recording) and a few that are on the original cast recording were cut later on…the wedding duet “Believe” (a rather forgettable bit about “I place my faith in you, I do believe in you…”) was cut and replaced by a rewritten version of “You are my Home”, a duet originally sung by Marguerite and Armand and later rewritten for Marguerite and Percy, for example. I think one of the weaknesses is that there is no definitive love duet for the couple in the musical. They have a wedding duet and a reprise of “When I Look at You” at the end, but for a couple famous for being so passionately in love, you’d think they would have a big number for them ala some of the genre’s love song greats such as "All I Ask of You" or "Somewhere". So overall, that’s the story of the musical. There is a bit of language in a few songs and one or two that you may want to skip, but overall the weakness of the story is not in its content as much as the lack of content. Give it a new script, cut a few songs and write a nice love song for Percy and Marguerite, give it a bit of tweaking here and there and you’d have a lovely musical, but as it is there’s definitely much to be desired. For all of the bad rap, you may be surprised to know that I own the cast recording and listen to it often, and absolutely adore the songs I mentioned above (and despite my apathy, still look up and watch bootleg clips). Adore as in listen to at least once a week adore. 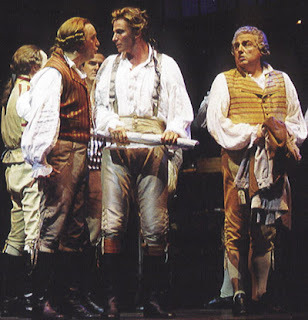 I guess my verdict for the Broadway musical The Scarlet Pimpernel is listen to it for a few great songs about our favorite hero …but this in no way even comes close to holding a candle to the definitive (IMO) version of the story aka the 1982 film. But being the enormous TSP (and musical theatre) fan that I am, I can’t help but have a soft spot for it, no matter how insipid some of it is. Looking over the review (and after watching a few bootlegs and listening to the songs again) I sit back and say, ‘oh, but I do love it!’ Then I take a closer look and think, ‘what on earth do I like about it?’ Soooo it’s hard to say. I guess when it comes down to it, I’m a purist fan. Which is kind of ironic, since the 1982 film is in a lot of ways hardly purist, but then I take refuge in the fact that I saw the film before reading the books. So the nitty-gritty details, especially when it comes to exactly how Sir Percy is portrayed, is a big deal to me. But for the casual fan of The Scarlet Pimpernel (or for those of you who aren’t bugged at the idea of Sir Percy not being Anthony Andrews) you’ll probably enjoy the musical. This could just totally be me...but I can't picture Percy going around without a waistcoat at least. There are some lovely alternative versions of the songs by various artists…as I mentioned above, Daniel Rodriguez, a tenor from New York does a lovely job with some of the songs from the musical – Into the Fire, She was There, and Only Love on several of his CD’s. Highly recommend those versions. 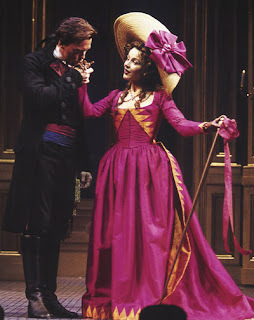 Also as I mentioned above, there is an Encore recording done when the musical was resurrected for tour with Douglas Sills again in the role of Percy and Rachel York as Marguerite. The only reason I would recommend this is to hear “I’ll Forget You”…otherwise stick with the original, as the best Marguerite and especially Chauvelin are on the original cast recording. I’ve unfortunately had issues with uploading this to YouTube so you’ll have to settle with Blogger. Sigh. So there you have it! Thanks again to Maria Elisabeth for allowing me to post! It's been a monstrous honor! And since I couldn't choose which was better...... here's both. Doesn't Chauvelin look like a wily little fox? And because, of course, we need a little scarlet. The above button with a few alterations. Because this needs to be proclaimed everywhere........ and who is more qualified to proclaim it than Marguerite herself? Love the scenery in this scene! Please take these and put them on your blog. I hope you have as much fun seeing them as I had making them! Pardon the un-Pimpernelish exclamation, but that was exactly my reaction. But they're not even doing it. Really, EU? Was that absolutly necessary? Why can't you just keep the copyright laws like they were before? 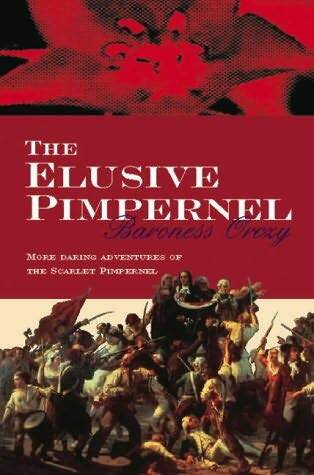 "But they do say that this same Scarlet Pimpernel is mightily ill-favoured, and that's why no one ever sees him. They say he is fit to scare the crows away and that no Frenchy can look twice at his face, for it's so ugly, and so they let him get out of the country, rather than look at him again." 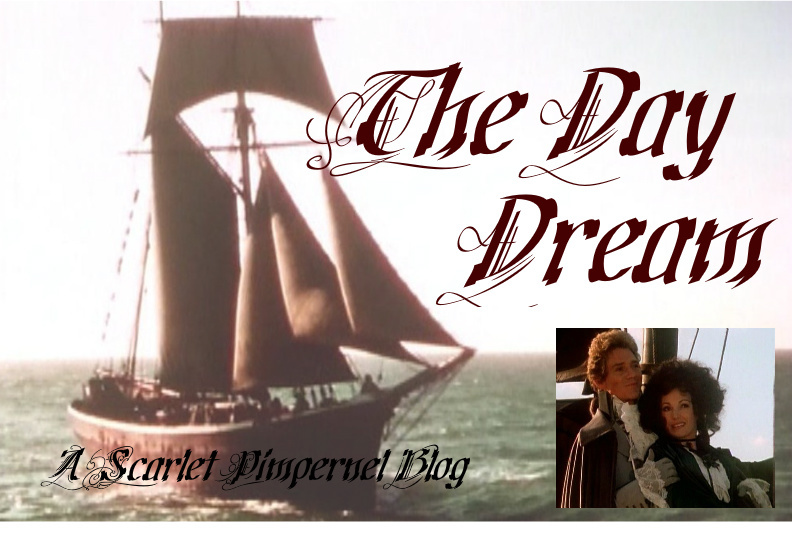 After their misunderstanding in The Scarlet Pimpernel, Marguerite and Sir Percy are living together in England, their happiness marred only by Sir Percy's constant ventures to France. Marguerite, constantly fearing for his safety, wishes for him to stay more in England, but Sir Percy, still hearing the cries of the innocent people, continues in his undertaking. Chauvelin, maddened by his failure to capture the elusive Scarlet Pimpernel the year before is ready to try again. He is the only man in France who knows the Pimpernel's identity and he means to make good use of it. He does not mean to send that hero to a martyr's death; oh no, that would be too tame and ineffectual for him. What he plans is the dishonour of the Scarlet Pimpernel, and thereby of the whole League, and as hostages for this he will hold not only Marguerite, but a whole city of innocent people. The Elusive Pimpernel is available free as an e-book from Gutenberg, an audiobook from Librivox, or a paper book from your library. If all else fails, you can get it as an un-free book from Amazon. Dishonour and ridicule! Derision and scorn!" he (Chauvelin) murmured, gloating over the very sound of these words, which expressed all that he hoped to accomplish, "utter abjections, then perhaps a suicide's grave..."
He loved the silence around him, for he could murmur these words and hear them echoing against the bare stone walls like the whisperings of all the spirits of hate which were waiting to lend him their aid. "The lud live you, Monsieur Chaubertin, and pray how do you propose to accomplish all these pleasant things?" In a moment Chauvelin was on his feet and with eyes dilated, lips parted in awed bewilderment, he was gazing towards the open window, where astride upon the sill, one leg inside the room, the other out, and with the moon shining full on his suit of delicate-coloured cloth, his wide caped coat and elegant chapeau-bras, sat the imperturbable Sir Percy. "I heard you muttering such pleasant words, Monsieur," continued Blakeney calmly, "that the temptation seized me to join in the conversation. A man talking to himself is ever in a sorry plight... he is either a mad man or a fool..."
"Far be if from me, sir, to apply either epithet to you... demmed bad form calling another fellow names... just when he does not quite feel himself, eh?... You don't feel quite yourself, I fancy just now... eh, Monsieur Chauberin... er... beg pardon, Chauvelin..."
Welcome to 'The Day Dream'! I am delighted, my dear Monsieur Chaubertin (er, beg pardon.......... Chauvelin) to welcome you to the Day Dream. On this - Sir Percy Blakeney's private yacht - there are no one except the members of the League, brave and dauntless; and Sir Percy himself, even more brave and dauntless. Sink me! I'm so glad you've come to see the launching of the Day Dream. *Random nonsense on The Scarlet Pimpernel, Baroness Orczy, and the French Revolution. *Lots of pictures. I go through the (1982) movie with my hand on the 'print screen' key, stopping every minute to think, "Oh, what a hilarious scene!" or "Percy looks so heroic there. I just need a screencap!" *Lots of guest posts and (hopefully) discussion topics. *A whole lot of fun. *Constant but unscheduled posting. It is an acknowledged fact that whenever the Scarlet Pimpernel is least expected, then a post about him will immediately appear. *Intelligent thought. The reason I admire Sir Percy's intelligence so much is that I have absolutely no brains at all. Just sayin'. *Becoming seriousness. Seriousness is never becoming, especially in the presence of ladies.